The Nvidia-only GPU and motherboard manufacturer has the best customer service ever! 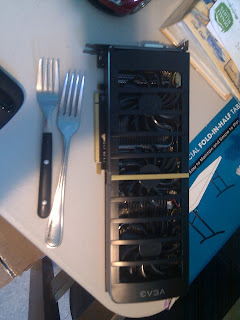 Remember the GTX 460 2Win I got from eBay? It stopped working a couple of weeks later. I instinctively opened an RMA request on EVGA's website and mailed the defective card in, only realizing after I dropped it off at USPS that the warranty-is-void sticker was removed! I panicked and prayed that EVGA would be nice and send me a replacement anyway. Less than a week later, EVGA calls me, but I didn't pick up since my 6.02 exam was about to start (literally). A couple days later I receive email from EVGA that a replacement is coming my way! I checked the serial number and it indeed is not that of the one I sent in! Woo! I finally took the time today to retrieve it from desk and test it. After booting my computer with my 30" plugged into the unit, I got a black screen, so I rebooted the machine. No luck. I then installed my 8800GTS (another EVGA card), plugged the 30" into that, and the machine booted with video. It's a bummer that the card has issues driving my 30", but I bought it for compute, so no worries. I'm convinced that EVGA was nice only because I mentioned that I have an SR-2 in the RMA request.